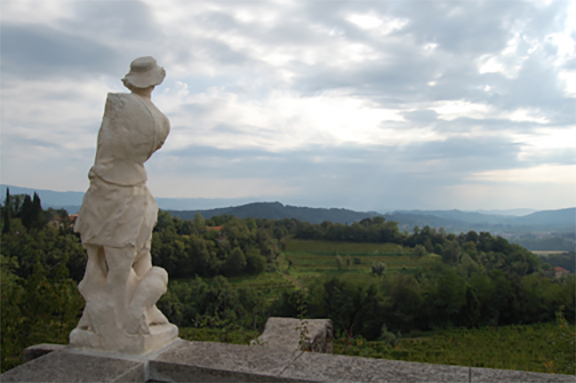 Above: a view from the Abbey of Rosazzo in Friulian wine country. In a press release issued today, the editors of the 2016 Gambero Rosso Guide to the Wines of Italy have informed readers that they have “suspended” an undisclosed number of Friulian producers of Sauvignon Blanc from the list of Tre Bicchieri (Three Glass) winners. They have released the names of winners of the prestigious award, they write, “with a reduced flight [of wines] because of ongoing legal questions… for which we have preferred to suspend our evaluation” (source: Intravino; translation mine). Allegations that 15 Friulian winemakers had used prohibited additives in their wines were first made public in September of this year. In an op-ed he published on the popular Italian wine blog Intravino after anti-adulteration authorities raided wineries and the laboratory of at least one winery consultant, wine writer and sommelier Andrea Gori openly criticized the Gambero Rosso editors for accolades they had previously bestowed on wineries named in the inquiry. The inquiry was borne out of a suspicion in turn owed to the intense aroma of certain Sauvignon [wines]. These wines have a pungent character that doesn’t align with traditional-style wines produced here. This wouldn’t matter much if it weren’t for the many leading trade publications, not to mention the experts who judge international [wine] competitions, who have devoted ample attention to these wines and have made them the standard-bearers of classic Friulian Sauvignon. As an observer of the Italian wine trade for many years now, I have seen firsthand the power and impact of the coveted Tre Bicchieri award. The winners are included in a traveling tasting that visits three major U.S. markets and their wines often enjoy significantly more robust sales as a result of the prize and the attention it receives. Of the 24 winners announced today, only one has been awarded the Tre Bicchieri award for a Sauvignon [Blanc]. Many Italian wine guides release the names of winners for their top prizes in September and October each year. The Gambero Rosso began announcing the names of regional winners of the Tre Bicchieri awards last month.